Prestige (AM-465) was laid down 15 April 1952 by Wilmington Boat Works Wilmington, Calif., launched 30 April 1954; sponsored by Mrs. William R. Poulson and commissioned 11 September 1954, Lt. C. L. Frink in command. Deployed to WestPac in 1958, Prestige ran aground in Naruto Straits, Inland Sea, Japan, 23 August 1958, and was abandoned as a total loss. 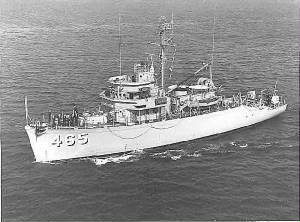 On August 21, 1958, USS Prestige MSO-465 in company with USS Pivot MSO-463 and USS Pluck MSO-464 departed Yokosuka, Japan en route to Kure, Japan via the Naruto Strait in Japan's Inland Sea. The Naruto channel is about eight hundred yards wide, but the navigable width is reduced to 200 yards in the vicinity of Naka Se. Prior to entering the Naruto Strait at about 0007 on August 23, the ships were directed to proceed independently through Naruto Strait and to rejoin at completion of the transit. At about 0135 in the morning of August 23 the Prestige went aground on Naka Se, at 34° 39´ North Latitude, 134° 39´ East Longitude. It was later determined that the visual bearings they were relying on were misinterpretations between two separate navigation lights and the Prestige was actually off course. At about 0230, attempts were made to lighten ship in an effort to back off the rocks. From this time until 1900, continued attempts were made to extricate herself by use of her own power. At about 0500 and again at 1607, Pivot made courageous but unsuccessful attempts to pull Prestige free of the rocks. At about 1900, flooding of the engineering spaces was out of control. At approximately 2345 the Captain gave orders to abandon ship. There were no injuries to any personnel. On August 25 and 26 typhoon Flossie passed through the area of the grounding and further embedded the Prestige in a cradle of rocks from which she could not be removed. When Current arrived, the Prestige was down by the bow 15 to 20 degrees and was subject to free flooding throughout the ship. Current spent two weeks of intensive salvage operations attempting to save the Prestige without success. After determination that the minesweeper was beyond salvage, the recommendation was to destroy the grounded ship with explosives. Permission was given by the Navy Department in Washington, D.C. to destroy the remaining hull. Current left the scene of the grounding for a two day trip to the port city of Kobe so that Captain Minard could obtain authorization from the Japanese Self Defense Force to detonate large amounts of explosives in the Inland Sea of Japan. The trip also gave the officers and crew a respite from salvage work. Current returned to the scene of the grounding with the Japanese approval to demolish the stricken minesweeper with explosives. On September 5, after offloading valuable equipment, 3, one thousand pound depth charges and 350 pounds of C3 plastic explosives were placed on the Prestige. The depth charges were detonated with one, five pound block of C3. At 1330, the charges were detonated, demolishing the Prestige, with the bridge burning down to the main deck.